The certification mark is awarded within the framework of voluntary certification. This data is available as anonymous information. It is processed within the course of data fusion thereby taking plausibility aspects into acount. Users with appropriate and compatible terminal equipment get those informations afterwards. Random field tests verify that the traffic information communicated by the navigation device reflect the ground truth on the roads. 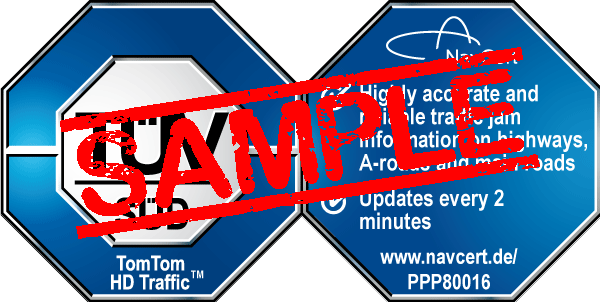 Features assessed include the verification of road congestions announced by the system (length and location), verification of the announced delay times and the delay with which the system announces that an area of road congestion has cleared. Cooperation with traffic control centres and numerous field tests in Germany validate the provision of reliable data for highways, A-roads and main roads. An on-site audit is conducted to verify whether the procedure used to process the collected traffic information is also capable of complying with the 2-minute real-time traffic update in extreme cases. In addition, system performance is tested and assessed with the help of various types of navigation equipment.